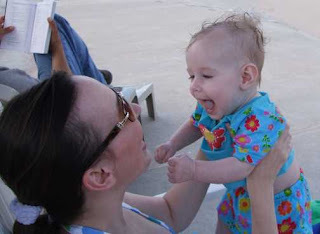 Today we went to the pool. 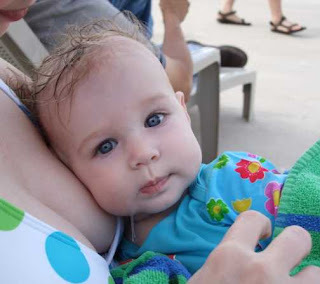 Since Aunt Sissy, Uncle Chris and Cousin Juliette were here....we all decided to go to the pool. 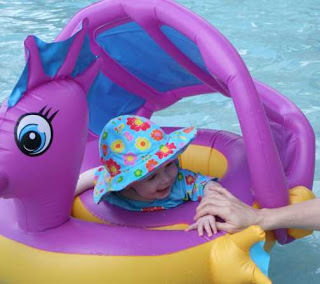 Mom and Melissa went to Target and bought Alice a swimsuit with matching hat, lathered up the kiddos with sun screen, and hit the pool. Dad brought a book and the camera to document the new experience. At first, Alice wasn't too sure about this water thing that obviously was NOT her bath...the water was colder and it was much much bigger than the tub. Plus, there were other kids running around, which in the end was fun to watch. 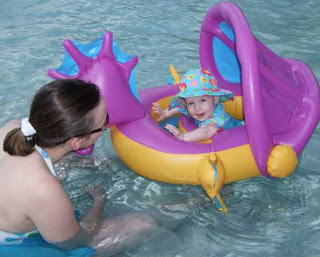 Mom took her around the pool leading the dragon floatie by the nose. After a while Alice started to get tired, so we went and sat down in a lounge chair to dry off. After drying off, we talked about how much fun the pool was and how Alice wants to come back. 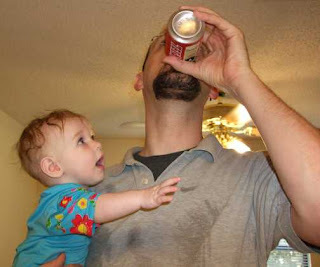 When we got home, Daddy cooled off with a beer, and baby thought it looked refreshing too. I LOVE these pictures... she looks so happy! How fun. What a great way to spend family time.